Trump assured CPAC attendees Saturday that America remains persistent in its goal to denuclearize North Korea, a promise that Vice President Mike Pence reiterated on Thursday. "I had to walk because every once in a while, you have to walk," Trump told a jam-packed room for his hours long speech at the annual gathering of the nation's conservatives. "The deal was not a deal. It was not acceptable to me. I don't like these deals that politicians make. They make a deal for the sake of doing it. I don't want to do that." 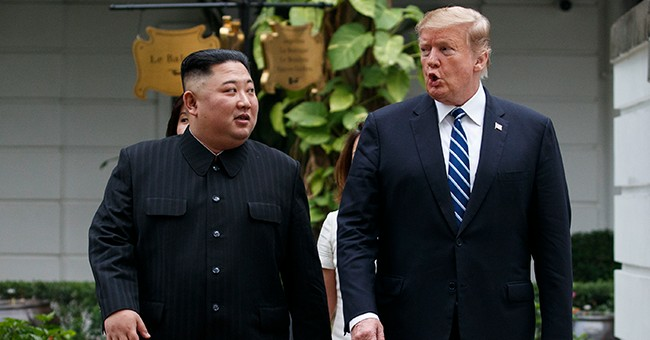 Townhall reported that President Trump walked away from a deal with North Korean Dictator Kim Jong Un, who was only willing to make some efforts to denuclearize the nation if the U.S. removed some of their sanctions on them. President Trump's decision to opt was a move that even liberal figureheads like Joe Scarborough complimented. Today, the president promised that if North Korea is willing to make a reasonable deal, one that would end the nuclear threat from the nation, then they will begin to see economic prosperity. "The relationship seems to be strong and that is an important thing," he said. "Especially if we are dealing with this kind of situation." President Trump faced controversy from conservatives and liberals for his comments on Otto Warmbier earlier this week, a student who was imprisoned by North Korea and died from his injuries after he was returned to the U.S. Trump said he believed that Kim Jong Un was unaware of Warmbier’s arrest and torture. "He tells me that he didn't know about it, and I will take him at his word," he said at a conference in Hanoi. Before he came to CPAC the commander-in-chief tweeted that just because he thought North Korea’s leader didn’t know about the incident which led the UVA student's death, didn’t mean that he thought North Korea was innocent. At CPAC, Trump gave his condolences to Otto's family, and said that it's difficult to balance successful foreign relations and defending each American citizen exposed to a horrendous attack.